This beautiful, newly-renovated two-bedroom apartment is located in a famous residential neighborhood surrounded by historic architectural brownstone homes. Experience the diversity of contemporary Harlem and the culture, arts, and residents of this unique community that has influenced every corner of the globe. Enter the property from a quiet, tree-lined street, up three flights of stairs, into an apartment with modern amenities and appliances, charming decorative fireplace, hardwood bamboo floors, and furnishings from the owner's travels worldwide. The living room, bedrooms, dining area and full kitchen are equipped with free wireless Internet (WIFI), cable TV and international channels (TV5, RAI, BBC), top-quality, clean linens and all of the comforts and conveniences of home. The B & C subway lines (direct transfer to express A & D lines) are steps from your door on the corner. In 15 minutes you are in midtown: Columbus Circle/Times Square. The Neighborhood: Harlem is a vibrant community, rich in arts and culture (The Apollo, Studio Museum in Harlem, St. Nick's Pub, Lenox Lounge, art galleries, The Schomburg Center for Research in Black Culture), historic architecture (Strivers Row, Astor Row, Hamilton Terrace, City College), cuisine (soul food, Ethiopian, French bistro, Dominican, contemporary American, Senegalese, Mexican, bakeries, Caribbean) and much more. Two blocks away, you will find 24/7 corner stores, Duane Reade (a citywide health and beauty chain store and pharmacy), and a Chase Bank with 24-hour ATMs. There are a number of takeout restaurants (Caribbean, Chinese, soul food) if you prefer to eat at home, and local bars (The Shrine and Londell's) where you are certain to meet local residents and fellow travelers. 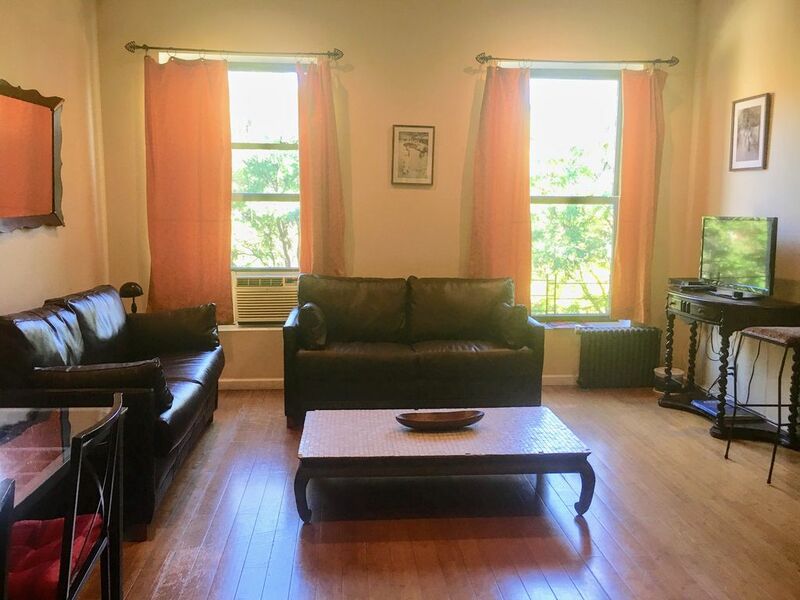 Nearby Attractions: The apartment is within walking distance of Central Park, Columbia University, Grant's Tomb, the Riverside and Abyssinian churches and half a block from St. Nicholas Park where the newly reopened Alexander Hamilton House is located. The M3 Bus is located steps from the apartment and takes you to the East Side's Museum Row (El Museo, Museum of the City of New York, Guggenheim, Whitney and Metropolitan museums). The M10, also on the corner, takes you to the Upper West Side (Museum of Natural History, Columbus Avenue boutiques and restaurants, Lincoln Center, movie theaters, and Central Park). Your Hosts: Your hosts are the property owners and they will ensure that your arrival is a smooth and comfortable experience. They have been providing vacation rental services and welcoming guests from all over the world for over four years. Having traveled, worked, and lived overseas, they enjoy meeting guests and providing them with all of the information at their disposal to make yours a memorable visit to New York City. Upon reservation confirmation, you will receive a package of information and referrals to assist with trip planning, and they are happy to share their insider knowledge of the city, recommendations for special events and discount shopping destinations, gospel churches, and trips to other boroughs and cities (Philadelphia, Boston, Washington DC). Families with children of all ages are welcome! FOR GROUPS OF 7-8, the owners will rent both properties at this location (2-BEDROOM #927780 and STUDIO #922743) simultaneously. The tiled bathroom is equipped with a full-sized bathtub/shower, Kohler fixtures, built-in medicine cabinet and fluffy 100% cotton towels in aesthetic colors to complement the bathroom's decor and tile. The large window overlooks the backyard and garden and invites sunlight throughout the day. Window air-conditioners which are controlled by our guests. Please remember to turn the air conditioners off when leaving the apartment. The building is heated by a steam heating system. Please do not attempt to regulate the heat manually as you could burn yourself. Kindly notify us if you need the temp to be increased or decreased. We provide clean 100% cotton sheets and quilts on the beds for your arrival. We also store cotton covered down comforters in the bedroom closets for seasonal use (easily be placed on top of quilts). A stackable washer-dryer is located in the closet next to the dining area. Laundry detergent tabs and fabric softener sheets can be found on top of the dryer for easy access. CLOTHES DRYERS ARE A LEADING CAUSE OF HOUSE FIRES. Please only use the dryer when you are in the apartment. An aluminum clothes-drying rack is stored in the bedroom closet for use in the bathtub. Parking is available free of charge on the street. Cars must be moved two or three times weekly to observe street cleaning regulations between 11:30am-1:00pm. There is a public garage located underneath/in the basement of the Strivers Gardens Condominiums located two blocks away at 300 West 135th Street. You may contact them for rates at: +1-212-368-1745. The bathroom will be stocked with 100% cotton towels and bathmat for your arrival. Please run the dishwasher when you leave the apartment so that you are not disturbed by the sound. Very large refrigerator that can accommodate ample groceries for large groups. Gas oven with two shelves. A selection of teas, coffee, sugar/sugar substitutes, and spices are stocked in the kitchen cupboard. There is a sufficient quantity of dishes for multiple meals. Dining table seats five guests. Our cable service is provided by Spectrum, formerly Time Warner Cable. We stayed in NYC for five days while our daughter toured various college campuses. This apartment served as a perfect home base. We were steps away from The City College of New York and St. Nicholas Park. The subway is also very close and served as a great mode of transportation for the duration of our stay. The owners were very helpful and accommodating. The apartment is clean and well appointed with everything you need for a comfortable stay. We enjoyed our stay in this spacious 2 bed apt. The very large and sunny bathroom alone was worth every penny. Both beds were comfortable and the living and kitchen were very functional and spacious. A main subway to downtown was steps away from our front door, with the express train only one stop away - so getting to/from downtown was very easy. If you want to stay out of the hustle and bustle and want some charm with plenty of room to relax with easy access to anywhere in the city for a good price, this is the place for you! We enjoyed our stay in this unit. It was very clean and the owner was easy to work with. In fact, she sent me more detailed information on the unit and the area (directions from the airport, nearest stores, tips on getting around, etc.) than I have ever received in the 10 or so times I've rented through VRBO/HomeAway. The apartment's close proximity to a subway station was perfect for us as that's how we got around in the few days we were in NYC. I consider this apartment a good value for what you get (its size, full kitchen, 2 bedrooms, etc.) and I would not hesitate to stay here again if we returned to NYC. An apt with much character & a lovely host. She was so informative & helpful. Breakfast items were provided and great suggestions made for places to go and how to get there. Our only problem was understanding subways. The walking distance from place to place once in the subway was overwhelming to my bad feet and knees. No ones fault but mine. The hosts were great & we felt very comfortable in the neighborhood. We have stayed in several places in Manhattan and found Kakuna's place clean and comfortable. The B and C trains are just down the street which makes access to Midtown and Times Square very fast (especially if you transfer to the A train at 125th Street). The bathroom is spacious, spotless, and modernized. The kitchen is well equipped and the beds are super comfortable. Best to have lighter luggage due to the climb up two stories of stairs. There is a refundabel damage deposit of $300 that isn't mentioned until after the property is booked. If you're looking for a place in Harlem - this one works wonderful. It has two actual bedrooms and full bathrooms. Full kitchen, dining and living room. It's quiet, clean and the owner is informative and responds quickly to any questions. The location is residential, safe and very close to a very nice local coffee spot, good restaurants, stores and the subway. So, basically, I'd recommend this place to everyone. Jens and his family were awesome guests! We look forward to hosting them again and wish them many more exciting travel adventures in the future.